Holy holy. You guys. We are super honored and thrilled to announce the arrival of precious little lover Sarah Sharp’s debut BOOK! Sarah is a long-time friend of Crimson Tate, teacher, accomplished quilt and pattern designer, an internationally recognized quilter, and total heart friend. We couldn’t be more excited. In fact, we’re so excited about Sarah’s amazing creations that we wanted to share the chance for a meet and greet with the author. On Friday, September 28, 2018 from 6:00 - 8:00 PM we'll be throwing a Launch Party and Meet & Greet with the author! Won’t you join us to celebrate? Snacks, a toast to Sarah and her beautiful work, and smiles will be in great abundance! RSVP to our Facebook event here. 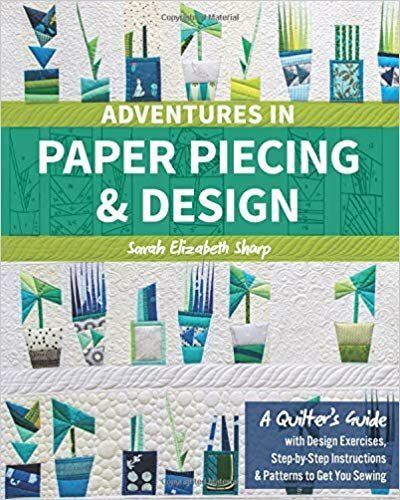 Right now, you have the opportunity to order your very own copy of the book, Adventures in Paper Piecing & Design, signed by the author herself. Choose store pickup if you're able to join us for the party, or have it shipped to your door.